Migration of MBOX files like Entourage, Thunderbird, Pocomail, Eudora, Spicebird etc. to Outlook importable PST files have often been a major problem faced by administrators and large-scale users. Conversion of MBOX files to PST is highly necessary as PST files provide extra security to users as well as their organized manner of storage. Also, switching of companies might require usage of previous MBOX files which could be easily done if they’re converted. Since the development of most of the MBOX files has stopped, such a software is extremely needed. There are lots of software available in the market for achieving this conversion but the one which is reliable is Stellar MBOX to PST converter. Stellar MBOX to PST converter is an innovative utility by Stellar Data recovery, a top rated data recovery service. It helps users of MBOX files to easily convert their mailboxes into Outlook importable PST files. There are two versions for this software, that is the normal one (SOHO) and the Technician version. With this software, you can find the location of the required MBOX files like apple mail, Thunderbird etc. and even convert more than one file simultaneously by selecting an identity folder containing them. There are certain system requirements that need to be fulfilled for the smooth experience in using Stellar MBOX to PST file converter software. The system should require a premium class processor with a hard disk of 50 MB of free space and a memory of minimum 1 GB. The process of conversion is quite straightforward and the software seems to be 100% reliable considering all the feedbacks. You can check the credibility of the software by downloading a free demo and save complete file after purchasing it. As the demand of Microsoft outlook has been increasing at an alarming rate, such a conversion utility will give users easy means of migration which otherwise entail a fair amount of time and expertise. Also, it’s highly interactive user-friendly interface is another plus point of this software. Moreover, the updated version (updated on March 2017) allows you to save converted mails in Office 365, RTF, PDF and HTML format (in tech version) and also supports the latest version of Outlook 2016 including 2013, 2010, 2007 and 2003. Converts required MBOX files like Thunderbird, Eudora, Spicebird, Pocomail, Applemail, etc. into Outlook importable PST files. Preview of converted mail items are shown if the conversion is successful. User-friendly interface with convenient Find file option in order to get the exact location of the preferred file. The converted mailboxes can be appended to any existing PST file or imported into a newly created PST file as per your needs and also can be imported into MS outlook directly to access all data. The direct migration of MBOX to Office 365 is an additional benefit given by the technician version. Technician version also allows multiple saving options. Select the preferred email client icon which must be converted into Outlook PST file. 2. If you have to convert multiple files in a folder, then click on Select identity folder or you can go for Select file followed by clicking on Convert button. 3. 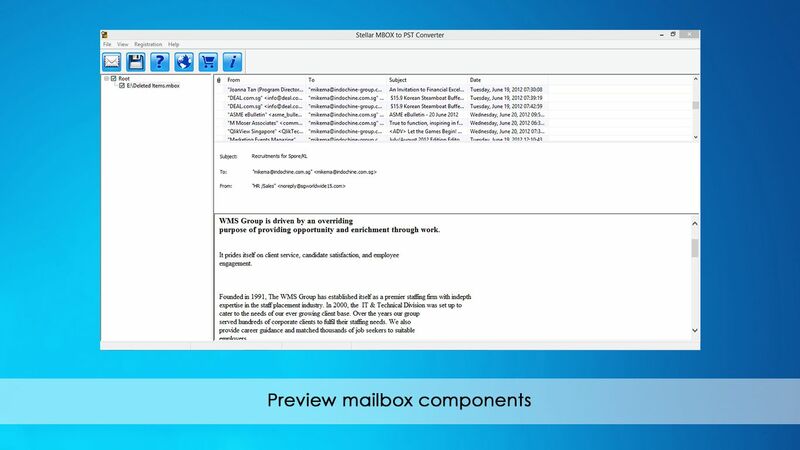 Check the preview of all the mailbox components and save the converted file into new or existing MS outlook PST file. 4. Voila! That’s it. You successfully converted the MBOX mail file into PST format. Now all you need to do is import the converted file format PST into your Outlook. This software saves the converted new data in the location specified by you. So after importing those files through Outlook, you can access it easily. Also, check out EDB to PST Converter by Stellar. Stellar MBOX to PST converter is a software that maintains data integrity during conversion, and thus a much-needed innovative utility. It’s 100% reliable as the data remains intact even after the conversion of an entire mailbox. It’s a competent tool which fulfills its purpose safely and accurately. The software avoids the hassle of manual method migration as the techniques are lengthy and full of risk. This converter tool is compatible with a number of operating environments such as Windows 7/Vista/XP, Windows Server 2012, 2008, 2003 and various MS outlook versions. The program follows a supremely intuitive user interface which explains all the required interactions with the application. It’s almost impossible to not transfer old emails into Outlook as it is impractical to have an email client that is not supported by Stellar MBOX to PST converter. You can read, export or print the mail in accordance with your requirements. The only drawback is the design. It could’ve been a bit more attractive. Give this program a chance if you’re looking for an easy, user-friendly software.